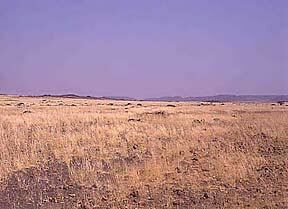 Deserts cover about one fifth of the Earths surface and occur where rainfall is less than 50 cm/year. Although most deserts, such as the Sahara of North Africa and the deserts of the southwestern U.S., Mexico, and Australia, occur at low latitudes, another kind of desert, cold deserts, occur in the basin and range area of Utah and Nevada and in parts of western Asia. Most deserts have a considerable amount of specialized vegetation, as well as specialized vertebrate and invertebrate animals. Soils often have abundant nutrients because they need only water to become very productive and have little or no organic matter. Disturbances are common in the form of occasional fires or cold weather, and sudden, infrequent, but intense rains that cause flooding. The seasons are generally warm throughout the year and very hot in the summer. The winters usually bring little rainfall. Temperatures exhibit daily extremes because the atmosphere contains little humidity to block the Suns rays. Desert surfaces receive a little more than twice the solar radiation received by humid regions and lose almost twice as much heat at night. Many mean annual temperatures range from 20-25° C. The extreme maximum ranges from 43.5-49° C. Minimum temperatures sometimes drop to -18° C.
Rainfall is usually very low and/or concentrated in short bursts between long rainless periods. Evaporation rates regularly exceed rainfall rates. Sometimes rain starts falling and evaporates before reaching the ground. Rainfall is lowest on the Atacama Desert of Chile, where it averages less than 1.5 cm. Some years are even rainless. Inland Sahara also receives less than 1.5 cm a year. Rainfall in American deserts is higheralmost 28 cm a year. Canopy in most deserts is very rare. Plants are mainly ground-hugging shrubs and short woody trees. Leaves are replete (fully supported with nutrients) with water-conserving characteristics. They tend to be small, thick and covered with a thick cuticle (outer layer). In the cacti, the leaves are much-reduced (to spines) and photosynthetic activity is restricted to the stems. Some plants open their stomata (microscopic openings in the epidermis of leaves that allow for gas exchange) only at night when evaporation rates are lowest. These plants include: yuccas, ocotillo, turpentine bush, prickly pears, false mesquite, sotol, ephedras, agaves and brittlebush. The soil can range from sandy and fine-textured to loose rock fragments, gravel or sand. It has a fairly low salt concentration, compared to deserts which receive a lot of rain (acquiring higher salt concentrations as a result). In areas such as mountain slopes, the soil is shallow, rocky or gravely with good drainage. In the upper bajada (lower slopes) they are coarse-textured, rocky, well-drained and partly laid by rock bench. In the lower bajada (bottom land) the soil is sandy and fine-textured, often with caliche hardpan. In each case there is no subsurface water. The plants are widely scattered. In areas of shad-scale, about 10 percent of the ground is covered, but in some areas of sagebush it approaches 85 percent. Plant heights vary between 15 cm and 122 cm. The main plants are deciduous, most having spiny leaves. Widely distributed animals are jack rabbits, kangaroo rats, kangaroo mice, pocket mice, grasshopper mice, and antelope ground squirrels. In areas like Utah, population density of these animals can range from 14-41 individuals per hectare. All except the jack rabbits are burrowers. The burrowing habit also applies to carnivores like the badger, kit fox, and coyote. Several lizards do some burrowing and moving of soil. Deer are found only in the winter.